I ordered my book ( and two other Farmer's Wife books JUMPED into my cart) and was so excited I started pulling fabrics! Being a scrappy sewer, I have already resigned myself to the reality that there is going to be a massive mess in the sewing room and possibly the tv room since that is usually my winter sewing home. Looking for the perfect fabrics is a difficult task especially for a one year project. You need to find something to commit to, something you love, something that you will not tire of, something that gives you passion...it is kind of like choosing a spouse! It may even be MORE difficult because one you have sewn it, quilted it and bound it...it is final! SO much PRESSURE! There is not doubt what thread I will be using! Aurifil 50wt! I would use 2600 ( Dove) that is the perfect color when piecing with so many variations of colors but I am out, so I pulled some others that would work just as well :o) The 50wt is an Egyptian cotton two ply thread and very thin ( but strong) to help with perfect piecing and FLAT seams. I have heard that these blocks have some bulk in places, thinner thread will help make them not bulk up! So I have a tough decision to make but luckily a have a few weeks to decide! That is a tough choice. I'd suggest the Liberty of London fabric for the Farmer's Wife quilt and then continue your collection of flour sacks for the 1930s Farmer's Wife quilt. I'm taking a break from my FW quilt, but organization is key. I've been working at cutting the last 30 blocks and putting them in envelopes with any foundation pieces I need. That way I have significantly less stuff out while working and don't have to mess with cutting when I feel like working on the blocks. Tough stuff. Maybe it will come down to which one you will be able to cut? I know my heart would race and my cutter would hover if I ever approached either of those bundles of pretty. liberty fabric would look great. I have the book and plan to do the quilt, I bought the lessons on line ad have printed them off for when I get round to doing it I am sure to use scraps for mine.. Yesterday I bought the manual for the farm girl vintage by Lori Holt, could not resist it! I agree with the flour sacks bringing some authenticity to the quilt. I think I would probably do them in that. But how can you go wrong with Liberty of London? I'm doing the 1930s QAL too, after seeing your recent post about it. Exciting! I'm just going to paper-piece everything. I'm working on another paper-pieced quilt right now (using the blocks from Penny Layman's "The Paper-Pieced Home") & I'm just going to pull from stash & make it scrappy. But if I had to choose between Liberty & flour sacks, I would go for the flour sacks. Making a 1930s quilt with those fabrics would make me feel like a time traveler! I love your title! Choosing the right husband to put up with fabric...priceless! I think Liberty would be a beautiful choice! Then again...the feedsack prints would also be amazing! Picking fabric is the hardest part of quilting for me! I know you will choose wisely! 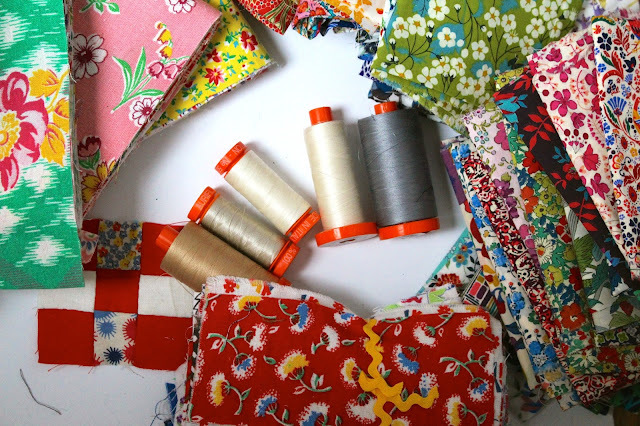 What a tough choice, but for a year long project I would go with the fabric that really makes your heart sing... and that sounds like the Liberty to me! Good luck making your choice! I love my Liberty too but I am going with Lecien Old New 30's and some Tasha Noel. I haven't even begun to really think about fabrics and I'm starting to feel the pressure. I'm making 1 version in all the fabrics in the FQS bundle, but I'm also doing a version as a scrappy take on the blocks. Could you mix both the Liberty and the Feed Sacks? (I'm not sure if you know this or not, but you could go through your purchase history on both eBay and Etsy and work out where you got them from. ;) :) ) I'm using 50wt Aurifil as well. Which was a good reminder that I need to put a thread order in. :) Can't wait to see this grow! I would go with the Liberty fabric since you love it so much. I love the idea of doing the Farmer's wife quilt with liberty!! I would mix them up! You could even make blocks from each book and mix them up too! 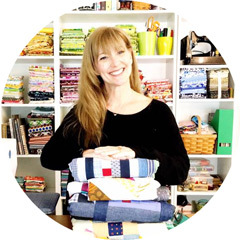 As much as I admire quilts using one style of fabric it feels like a safe and predictable option but then I agree you should use what you love! Perhaps you could pick your favourite prints from both and see if they merge well together? The Liberty is realllllyyyy pretty!